It’s a lot of work to homeschool so many kids, but life is never dull. Spending so much time with kids gives me a lot of material to write about-if only I had the time to actually write. Jessica is starting kindergarten this year and if you know Jessica, you would understand my apprehension about starting school with her. Jessica knows what she wants to do and she is pretty strong-willed about doing things she doesn’t want to do. For example, up until a month ago, Jessica insisted she could NOT count to 10. She said she was only 5, so she would only count to 5. Now I knew she knew how to count to 10, but she definitely wouldn’t do it. She would count to 5 and then backwards to 1 and somehow knew this was equal to counting to 10 for hide and seek games…she’s a smart cookie. Much to my amazement, she has embraced homeschooling and so far, she loves it. I cannot come up with enough for her to do. All the things she has been stubborn about trying-writing, counting, etc…she is now eager to learn and do. Except the number 3. She is convinced that she cannot write a number 3. She will “try” but it always ends up either a 2 or a squiggly line. I have seen Jessica make the letter B so I know that she is capable of making a 3, but it’s not on her agenda or she has convinced herself she is incapable…who knows. Her new thing is to copy down BIG numbers off things. She told me this morning, “I’m looking for BIG numbers to copy in my book, but not numbers with a 3 in them because I can’t make 3’s.” She feels the need to show me she can do these big things and is trying to prove to me that 3 just isn’t important. I started thinking about how much we are all like that. We want to do something for the Lord. 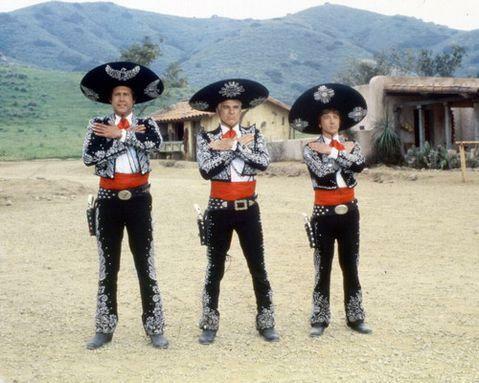 We want to serve or grow in areas and do great BIG things, but we often have a 3 somewhere in our lives. “God, I will do anything you want except _____” or “I can do this thing, just don’t ask me to do that.” We limit ourselves so much by thinking we are incapable of doing something or by being unwilling to do something. God is not usually asking us to do the BIG thing, but rather the small obedient thing. He is not asking us to do something in our own abilities, but asking for our obedience and then working through us. Take a long hard look at the 3 in your life. What are you missing out of by trying to avoid it? Have you fooled yourself into thinking the big is better than the 3? Have you stopped growing because you refuse to tackle the 3 in your life? Jessica and Chloe were getting ready for bed when Donald noticed a bucket filled with water in their room. When he asked them about it, they had been dipping little cups in the bucket to get a drink of water. Where did the water come from? Chloe had dipped the bucket in the toilet to get water, so they had been drinking toilet water. Now I’m sure to my girls…they thought they were drinking clean water. It looked clean. It was clear. The potty had been flushed. 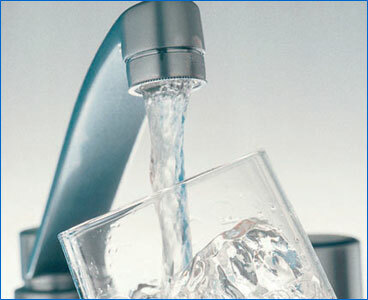 It looked just like the water out of the faucet, but those of us who have lived life a little longer understand that toilet water is not the water you want to drink. Why would a kid drink toilet water? Maybe they wanted to be “big” and get it themselves or maybe they thought if they asked me for a bucket of water, I would say no, so they didn’t ask and got it the only way they could. Either way, kids often do things like this…how many of you cut your own hair when you were little? Most parents have a nice photo of their kids with a hunk of hair missing. Talk with your parents and other mature believers. God will not lead you astray. God in His sovereignty puts us in the exact places we should live for a reason, so that we might come to find Him. In each time of life, in each place we find ourselves…God has something for us that we don’t want to miss. 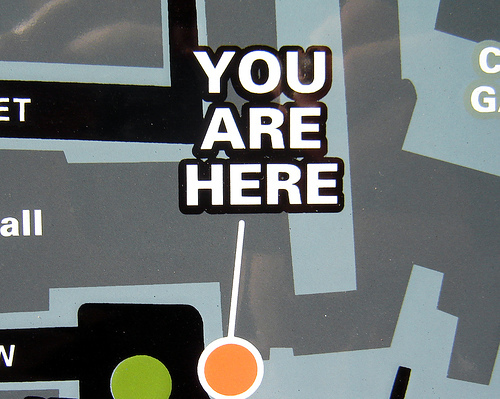 For some people the “You are here” is not a physical place, but a time of life. We are always waiting for the better place…when I have a boyfriend, when I am out of school, when I am married, when we have children, when I get the promotion, when we buy a house, when we get out of debt, when the children are gone…always longing for the next stage of life without really wanting to live the stage we are in. I wonder how often we miss the lesson God has for us by quickly trying to get to the next place. But if we move on without learning what God has for us…we move on arriving handicapped. If a baby doesn’t learn to sit, how can she learn to walk? If you don’t practice the notes, how will you ever play the song? Maybe that is why so many of us with easy access to God’s word are still so immature spiritually. We refuse to take the time to learn what God has for us and to find Him where we are. We don’t have the patience to learn the lesson before we move on. So wherever you are today, know that YOU ARE HERE with a purpose. God wants you to find Him in your circumstances and it is worth the struggle of today. Well…sickness has again come to the Buttram house. 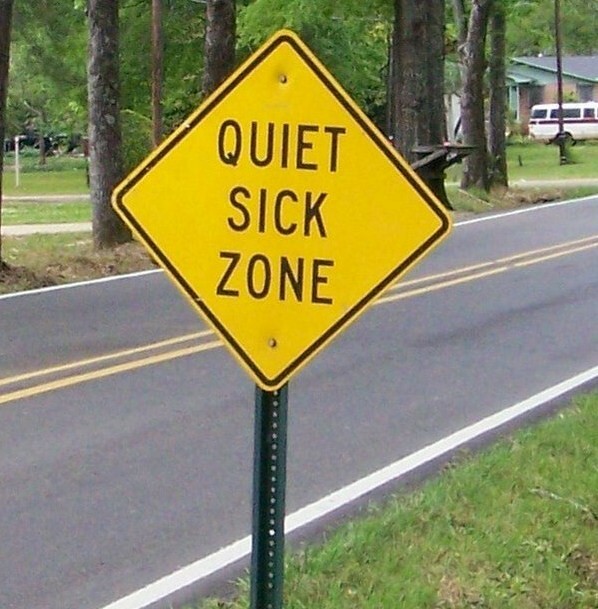 We don’t seem to be sick very often…which is a blessing. It also strikes me odd that we ALL don’t get sick. You would think with a house of 8 people…when one gets sick, we all do. BUT that just doesn’t happen…usually only a couple of us get the same thing…another blessing to be sure. Jessica woke up in the middle of the night just to tell me that she is really sick. I never doubt Jessica’s mid-night revelations…they are usually true. She woke up once again this morning (she was sleeping late…not a good sign in my house), she sat up in bed and preceded to tell me again she was very sick, needed a stool beside her bed with a cup of tea, and the cup needed a lid and a straw. She laid back down and fell asleep. Such clarity of thought! I am convinced Jessica could supervise almost anything under any stress…it’s a gift. I wonder if they could use a 4-year old as a platoon leader in battle? Jessica finally awoke at 8:30am to vomit. No fever. She handles it all in stride. She went to sleep for another half hour before repeating the event. Then she told me she needed me to fix her a bed on the couch so she could watch Playhouse Disney. She has vomited on schedule every half hour. I think she makes her body wait for commercial breaks. She hasn’t eaten anything yet and still has no fever. She really is a easy sick person to take care of. Joshua on the other hand gets the sick person award in our house. He actually has medaled in quite a few categories: Most likely to vomit when not sick. Most likely to gag at any sight, smell, or thought. Most likely to take all day to vomit (after all he doesn’t want to throw up. This logic always seems to bother me…who WANTS to throw up?). Most likely to not make it to the bathroom to vomit (After all he is trying really hard not to throw up because he doesn’t want to). I would say he is most likely to be sick the longest, but I think I get that award. We are blessed that Josh doesn’t really get sick often. So I guess some sort of stomach virus has made it into our house. Who will get it next? You will have to check back later to find out. The table beside my bed is filled with books I have just read, I am reading, and I want to read. Some are Bible studies like “Having a Mary Heart in a Martha World” by Joanna Weaver. Other books are for training such as “Children’s Ministry Leadership: The You-Can-Do-It Guide” by Jim Wideman. I love to read. I just finished a book that I cannot help but tell you about. 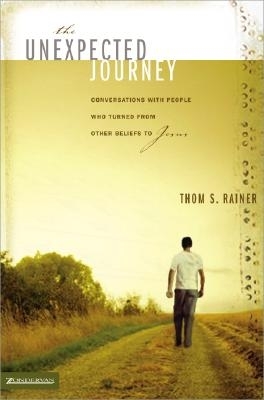 It’s titled “The Unexpected Journey: Converstaions With People Who Turned From Other Beliefs to Jesus” by Thom S. Rainer. Donald passed this book on to me after he read it for a seminary class. It contains interviews with people from various different belief systems that came to a relationship with Jesus. They are amazing testimonies that God is able to change the “unchangeable”…those we would easily give up on. Nine interviews had taken place. Nellie Jo and I agreed that two powerful truths has emerged. First, the power of Christian love was a story line in most of our interviews. In one way or another, the theme of love was sounded with clarity. This book also shows how the acts of unloving Christians hindered earlier searches for truth in many of these people’s lives. It is quite convicting. Give it a read. I’m sure you won’t be disappointed. I am part of the Ladies Bible Study and we are reading “Having a Mary Heart in a Martha World”. Sherry encouraged each of us to identify one area of our Christian walk that we need to work on and right it in the cover of our book. Then at the end of the study, we will look at it again and see what God has done in that area of our lives during our study. Immediately the area I thought of was the area of prayer. I’ve been reading “Transforming Children into Spiritual Champions” by George Barna (excellent book) and I was convicted that I am not more intentional in my prayers. Now I pray. If someone ask me to pray for them, I do it right away. If I feel a burden for someone, I will pray for them. I tend to carry on-going conversations with God off and on throughout the day. BUT do I intentionally pray for each child in our church by name? Do I lift up each family in our church in prayer? No. I don’t have a system in place that helps make sure I am lifting up family and friends in prayer on a regular basis. BUT when I think about long sessions of prayer (I had a friend who was a mother of 6 boys and she would pray an hour each day before her kids woke up), it feels more like a burden than a pleasure to me. Several years ago, we went through “Power of a Praying Parent” in our study and trying to pray through every aspect of our child’s life felt more like a burden and a guilt trip then a loving, freeing experience with God. I know people who have powerful prayer lives and it brings them such joy and satisfaction and I think…what’s wrong with me? As I was pondering these things on the way home last night, a verse from our study came to mind. Now I’m a server. My spiritual gift is the gift of service. I love to serve others. Over the years I cannot tell you the number of times people have said to me “You do too much. You need to cut back on the areas you serve in” or “If Kristie is doing all of this, then I need to do more too.” I have tried to tell people that I wouldn’t be happy doing less. I don’t serve because I am trying to earn something or because I feel guilty. I serve because it is my spiritual gift and using my gift brings me joy, satisfaction, and a sense of purpose. “For my yoke is easy and my burden is light.” I feel like when I serve, I am picking up the yoke Jesus has given me instead of the one I try to create for myself. It seems like too much work to others around me, but to me it is not a burden at all. I have found the place Jesus wants me to be and that has made all the difference. So intercessory prayer may be like that. For some it is a spiritual gift God has given them and it brings them a joy and satisfaction that I could not experience if I tried to do what they were doing. That doesn’t mean that I shouldn’t pray just as it doesn’t mean they shouldn’t serve. I do believe I need to strengthen my prayer life and focus on it. God wants us to pray and there is power in prayer. What should my prayer life look like? As I shared all this with my husband, his immediate response was “You need to read Philip Yancey’s book Prayer: Does It Make Any Difference?” Donald said the book covers all those questions I have. So I am starting to read it and looking forward to finding out what perspective Yancey has on the discipline of prayer. Pray for me 🙂 as I journey to discover what God wants from my personal prayer life. My friend, Deanna, introduced me to a new CD a few weeks ago. It’s called “Glory Revealed” by various artist (Mac Powell, Steven Curtis Chapman, David Crowder, Michael W Smith, Mark Hall, and more). The songs are all Scripture set to folksy music. It’s very relaxing and uplifting. I’ve been playing it in my kitchen CD player while I go about my day. I was going to recommend my favorite, but when I think of them, I like them all. You can check out Glory Revealed for yourself. Let me know if you like it. There is a sign above my front door that reads “Welcome to the Zoo”…that is often an acurate description of our household. Except for the constant mess, I love it that way! Joshua had his 12th birthday a week ago. After he opened his presents, he had a small rectangular box one of his gifts came in. Like all good 12 year old boys, he knew just what to do with it…he handed it to Jessica (our 4 year old) and said, “Here’s a coffin for your Barbie” (only 12 year old boys think of great uses for boxes like that). Jessica was thrilled to have the box so she quickly said “Thank you.” Then with out missing a beat, she opened the box and “coughed” in it. I don’t think she quite understood the coffin remark, so she just made it fit what she thought it meant. We all cried, we laughed so hard. Jessica thought this was great, so she spent the rest of the night “coughing” in her box. Speaking of Jessica, she has officially changed her last name. She told me that she should now be called Jessica Teenager. For several days now, if you address her as Jessica she corrects you and says, “You mean Jessica Teenager.” I’m not quite ready for Jessica Teenager yet…or maybe ever. We bought a Keurig machine and we LOVE it. We bought the basic B40 model since I didn’t want to spend an extra $30 on a digital display. It’s so easy to use and NO mess. We do find ourselves making more coffee though. Donald bought the kids ROCK BAND for PS2 last night. We finally broke down and got it…our kids were so thrilled UNTIL they tried to play it. Suddenly our PS2 isn’t reading discs anymore. It was fine when the kids used it earlier that day, but now it’s broken. Donald and the kids spent several hours trying to fix it, but it’s still broken. My poor kids, they were so disappointed. Donald takes his test for Master Sgt. today. He’s been studying so hard. Yesterday he had the day off work to study one last day. After several hours, he decided he just needed to relax. He and I went out for a nice quiet Chinese dinner. After dinner, we both opened our fortune cookies. Donald’s fortune read “You are next in line for promotion at your firm.” We almost died…how funny is that! We had a good laugh. Emily turned 17! I can’t believe my daughter is seventeen. She had a friend over. They went ice skating and to the Marine Corps Museum. We had Chinese take-out for dinner. She got texting back on her cell phone…she’s happy about that. I think she had a fun day. Never a dull moment at our house. I’m so glad that along with all the daily drudge (housework, cooking, planning, etc) that my husband and my kids help me laugh at least once every day. What a joy! Daniel has been going to “big” church since last September. It has been fun to watch him adjust to sitting through service. His initial impression was that it was boring, unless they showed a video. Now I’ve been in boring churches and our church does not fit that description at all, but if you can’t read the words to sing the songs or follow the notes, then I could see how it might be boring to just try and sit still for that long. Then when Daniel got use to the routine of being in church, he moved into his interactive stage. If Pastor Steve asked a question, Daniel wanted to give his answer out loud, right then. Daniel also thought it was okay to add comments (out loud, of course) as Pastor Steve would preach. This was a fun stage for me…NOT! Then two weeks ago, he made a break through and started “taking notes” on his pad of paper. It was the story of creation and Daniel wrote on one piece of paper “God did it.” He heard Pastor Steve say those words and he knew how to spell them, so he wrote them down. Then he flipped to the next page and wrote “I am free to run.” That was a line from the song we sang earlier. I was so excited, because he WAS actually listening to what was going on. This past Sunday he didn’t take notes,but he got tickled at the title “The Blame Game”. We’ve been working on long vowel sounds with a silent e and he was so excited he could read those words. He thought it was the funniest title and he couldn’t stop giggling about it. Church with Daniel is an adventure for sure, but it is fun to watch him learn about what is going on and start participating. By the time he has this all down, Jessica will be joining “big” church and we will start all over again. Who Moved My Cheese? by Spencer Johnson, M.D. is a small, but powerful little tale about two mice and two little men who find themselves searching for cheese in a maze. When their cheese is moved, how do each of them deal with the change? Donald and I discover the book over a year ago and love it. We bought it and so with all the coming change in my life (see last two posts) I decided it was a good time to pick it up and read it again. It’s only 93 pages with large print, so it’s a easy nap time read. The great thing about this book is that it applies to so many areas of my life. All of us go through change…it is inevitable, but we don’t always deal with it well. If we can put change into perspective and learn to handle it correctly, we would save ourselves a lot of stress and wasted time.